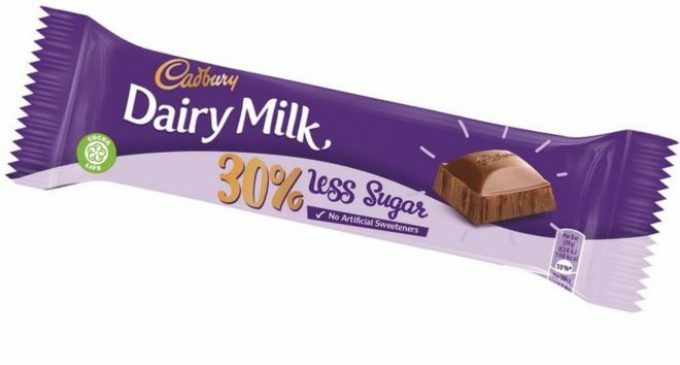 From 2019, the UK’s favourite chocolate, Cadbury Dairy Milk will be available in a new bar with 30% less sugar, offering consumers greater choice and helping them to manage their sugar intake. The new bar, which will sit alongside the standard bar on shelves, marks the most significant innovation in the brand’s history, and underscores Mondelēz International’s ongoing commitment to play its role in tackling obesity, including childhood obesity, in the UK. For almost two years, a team of 20 scientists, nutritionists and chocolatiers at Mondelēz International’s Reading and Bournville research and development facilities have been working to find a way to achieve the much-loved Cadbury Dairy Milk taste whilst delivering 30% less sugar with no artificial sweeteners, colours or preservatives and no increase in calories. By harnessing their leading-edge understanding of flavour technologies and material science, the team has successfully replaced the physical functionality of the sugar in solid chocolate in a way that not only preserves the structure of chocolate but also stays true to the unique texture and taste profile of Cadbury Dairy Milk. If successful with consumers, Mondelēz International will also look to apply to the approach to other Cadbury Dairy Milk products. This new Cadbury Dairy Milk variant is just one of a number of lower sugar innovations planned for the UK market over the next two years as part of Mondelēz International’s strategy to increase well-being choices across its portfolio and help people to enjoy treats, such as chocolate, in moderation as part of a balanced lifestyle. These include; Cadbury Boost+ Protein, which will contain 12g of protein per bar and 32% less sugar than the standard Boost bar, ‘30% less sugar’ variants of Maynards Bassetts hero products,Wine Gums and Jelly Babies, and a ‘40% less sugar’ line extension on BelVita. Glenn Caton, President, Northern Europe, Mondelēz International, comments: “Our brands have been around for hundreds of years. They are a part of British culture and heritage and play a special role in people’s lives as treats to be enjoyed during a moment of indulgence. We are working hard to remind people of this; to help them make informed choices by providing clear nutritional information and labelling, as well providing more choice by expanding our portion control offerings and improving the nutritional profile of our brands. We believe this strategy is working, with people for example eating less chocolate today than five years ago.